His convention speech should draw from the wisdom of black women activists who were the prophets of American democracy. AP Images Rep. Barbara Jordan of Texas delivered a stirring keynote at the 1976 Democratic National Convention. When he accepts the Democratic nomination August 28, Barack Obama will give the most important speech of his life. The bar is set especially high after a primary season of soaring rhetorical achievements. Obama must capture the historical relevance of his nomination while keeping his focus firmly on the country as a whole. He must define the nation’s problems while conveying a spirit of optimism. He must promise to bring change while offering reassuring familiarity. As those in the Obama camp try to meet this oratorical challenge, I am sure they are culling the history of American political rhetoric, especially since his bid for the presidency inspires comparison. Proponents have likened him to the inspirational Bobby Kennedy, who was brash enough to take on his party’s elders. Some detractors have compared him to Bill Clinton, arguing that Obama is a moderate in charismatic clothing, hawking hope but wedded to the status quo. His hometown of Chicago compares him to the city’s machine-busting first black mayor, Harold Washington, and to another famous Chicagoan, the Rev. Jesse Jackson. On August 28, most will be listening for a resonance of Martin Luther King Jr. because Obama will be speaking exactly forty-five years after Dr. King declared, "I have a dream." These are fair comparisons, but they ignore another important tradition from which the Obama candidacy emerges–that of Fannie Lou Hamer, Ella Baker, Barbara Jordan, Shirley Chisholm and the many thousands of black women activists whose names history failed to record. These women are the lost prophets of American democracy. As a country we dimly recall their accomplishments and have almost wholly forgotten their words. The epic battle between Obama and Hillary Clinton heightened conversations about race and gender, but it did little to illuminate the intersection between these identities where black women leaders have made significant contributions. When Barack Obama takes the stage in Denver, he could draw on the political rhetoric of African-American women as the core of his historic speech. The Obama candidacy is built on the organizational foundation laid by these women at least as much as it is on the oratorical showmanship of black male preachers. Obama’s speeches may be reminiscent of Dr. King, but his organizing fellows program, use of existing social networks and concern with sustained mobilization recall Ella Baker, the inspirational activist whose work set the course for every major civil rights organization of her time. It was Baker who kept refocusing the movement on organizing rather than oratory, and her work showed that when citizens are given the skills to organize on their own behalf, rather than relying on charismatic leaders to show them the way, real change happens. Collectively we know very little about the deeds, lives and words of Baker and other black women leaders. Many Americans assume that they spoke about parochial, narrow or self-centered topics. Quite the opposite is true; black women’s political work hits the notes of inclusion, universalism and patriotism that Obama needs to emphasize. On July 22, 1964, Fannie Lou Hamer, born into crushing poverty in rural Mississippi and herself a sharecropper, testified at the Democratic National Convention. She spoke of how she was intimidated, threatened and viciously beaten merely for trying to register to vote. Her language was plain and powerful; speaking of the abuse of another black woman who tried to register, she told the DNC, "They beat her. I don’t how long. And after a while she began to pray and asked God to have mercy on those people." Obama can lay claim to Hamer’s legacy to remind Americans of the precious value of the vote. Hamer helps Obama tell the country that freedom was bought with the blood of soldiers on foreign battlefields and with the actions of ordinary, courageous, self-sacrificing citizens at home. In 1972 Shirley Chisholm became the first African-American woman to seek a major-party nomination for the presidency. Like Obama, she faced criticism for being a relative newcomer to national politics, but her outsider status was also the strength of her claim to leadership. While she was proud of her race and gender, she asserted, "I am not the candidate of black America…. I am not the candidate of the women’s movement." Running in the first election after the voting age was lowered to 18, she was especially concerned about mobilizing young voters. In the primaries, Obama, like Chisholm, presented himself as "unbought and unbossed." In Denver he will need to draw again on Chisholm’s legacy of independence, creativity and youth mobilization. 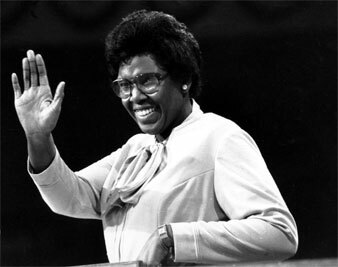 On July 12, 1976, when Barbara Jordan gave the keynote address at the DNC in New York City, she was the first black woman member of the House from Texas, a state whose Democratic Party perfected the all-white primary. Jordan recognized that her presence meant that "the American Dream need not forever be deferred." She refused simply to list "the problems which cause people to feel cynical, angry, frustrated." Instead, she acknowledged that Americans needed solutions to the problems of the present and ways to fulfill a broader national purpose of freedom and equality. Obama’s 2004 DNC speech was profoundly reminiscent of Jordan’s keynote. Jordan warned of the great danger America faced if we "cease to be one nation and become instead a collection of interest groups: city against suburb, region against region, individual against individual, each seeking to satisfy private wants." Obama, like Jordan, asked Americans to see their common interests and seek the common good. This year he must ask voters to cross lines of identity, party, religion and region to create a unified America. Obama’s acceptance speech will likely affirm the democratic vision articulated in Jefferson’s Declaration of Independence, reference Franklin Roosevelt’s dedication to a society that cares for all its citizens and refer to John Kennedy’s call to service and sacrifice. There is no question that Obama will acknowledge Dr. King’s inspiring dream. But he also has a chance to acknowledge the black women who helped pave the path on which he now walks and who offered vision and direction for the nation. He should take the words and deeds of these forgotten patriots along with him because when and where they enter, all Americans enter with them.